According to an article in today’s Columbus Dispatch (again with the Columbus newspaper! What’s going on? ), a study recently completed on Columbus-area Macy’s stores since the changeover from the retired Lazarus nameplate has found that foot traffic was down 4.5 percent in 2005, or nearly 50,000 customers. Columbus is the first city where such a study has been conducted, so it may prove to be an indicator that (as many of us suspected) Federated made the wrong choice in retiring the dozens of regional nameplates around the country in favor of Macy’s. Anecdotally, it seems that most here in Boston had long preferred Filene’s to Macy’s, who took over the local Jordan Marsh chain in 1996. These numbers from Columbus do not bode well for Federated in Chicago. They made a major mistake when they decided to combine everyting under one banner, and one that is much disliked at that! Macy’s has been chased out of the Midwest before. They’ve been kicked out of Kansas City and Toledo. Federated sold thier MainStreet division in Chicago to none other than Kohl’s (who made the stores wildely successful). Macy’s in Minneapolis is a dump from what I’ve heard — not popular with the locals. This is just the push needed to help BonTon with their new Carson Pirie Scott division and allow Dillard’s to enter the Chicago market. Expect BonTon to do much better in the future as Federated fades. Foley’s (Texas based) Stern’s (east coast) Higbee’s (midwest) Joslins, (north & South) and of curse Filene’s. No more chasing the bridal gowns. I really liked shopping at the Filenes in New York City. I don’t have a problem with Macy’s but they should have stayed themselves and left the other retailers alone. Foley’s here in Texas was doing great, so it was not like Macy’s had to buy them out to save them from closing up shop. When Foley’s finally changed over, Macy’s sent me a credit card to replace my Foley;s card. I don’t go to Macy’s much at all, preferring Dillards because I don’t feel that Macy’s here in Texas is like Macy’s in New York City. The old Foley’s that are now Macy’s are now really ugly. So are their bags. When I was a kid, Macy’s was the fashion-forward style setter, very trendy. Today, it is a completely different company, no different from any other mid-tier department store, but with their old name still intact. It is very confusing. Margaret? Higbee’s and Joslins were bought by Dillard’s, not Macy’s. Can’t say that I’m surprised that Macy’s has trouble after a name change. They fumbled The Bon Marche’ big time up here (NW). The employees raised a stink about how Macy’s was treating them differently (not as well as TBM) and got a nice little backlash going for a while. I used to live in TX–loved Foley’s, and Macy’s in a Foley’s isn’t the same. Boo. 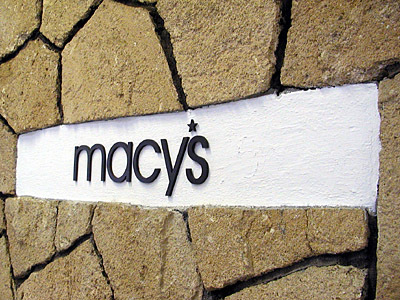 Am I the only one who likes Macy’s? I live in Milwaukee, and everyone is so up in arms here about them retiring the Marshall Field’s name plate. Not me. I thought the merchandise mix at Marshall Field’s had become mundane, frumpy, old, dated, and I could never find my size (S) before. The sales are better at Macy’s, and you know what? So is the service. No more of this “pass the Grey Poupon” attitude left over from Field’s. I was surprised to see that someone (see above post) thought that the bags are ugly. Especially compared to Foley’s. My parents live in TX and oftentimes sent me Christmas gifts from Foley’s. I had never seen so many ugly fashions in my life, and most of those purchases went to my 74 year old neighbor who wears tweed Chess King sport coats, shoulder pads and all, with mismatched pants seperates and “skinny” ties. The icky striped shirts with bold, medium purple and pink stripes from Foley’s were a welcomed addition to his hideous wardrobe. When I visited a Foley’s I felt like I’d stepped into a time machine and gone back to the 70’s. There were an outrageous number of mirrored surfaces and formica counters galore. Even the store’s facade, and logo font were insanely unattractive. I guess it’s just a matter of opinion. I personally like the Macy’s change. And to call them “mid-tier” to me is lumping them in with another one of my least favorite stores: Kohl’s. Yuck! @ CoryTJ: No way, I love Macy’s! Of course being in DFW, we had Foley’s previously. Macy’s is far superior as far as their products, their customer service, and their value. I’ve never had a problem finding assistance at any Macy’s (a common problem at Foley’s), and even returns and exchanges are seamless. I was even at one this weekend that had a Sunglass Hut inside (was looking for some shades), so my shopping experience was even more pleasant and convenient. I can’t speak for those that lost their beloved Lazarus or Marshall Fields, but as for Foley’s, I couldn’t care less. Macy’s is a welcome improvement. MC and CoryTJ: Don’t you dare make fun of Foley’s, because, well, they were like Marshall Field’s or Lazarus. The problem with Foley’s (et. al.) was that they simply ranged from dumpy to upscale. There were several “eras” of Foley’s stores that did, unfortunately, translate to dumpiness. There was the 1960s Foley’s (Almeda Mall and Northwest Mall), the 1970s Foley’s (Greenspoint Mall and San Jacinto Mall), the 1980s Foley’s (Post Oak Mall or Padre Staples Mall, now La Palmera). The 1990s Foley’s (Mall of the Mainland, First Colony Mall), the 2000s Foley’s (The Galleria or the rebuilt Memorial City Mall location). And then there’s the Sanger-Harris Foley’s (Six Flags Mall, Valley View Center, and North Hills Mall), the Dallas chain.